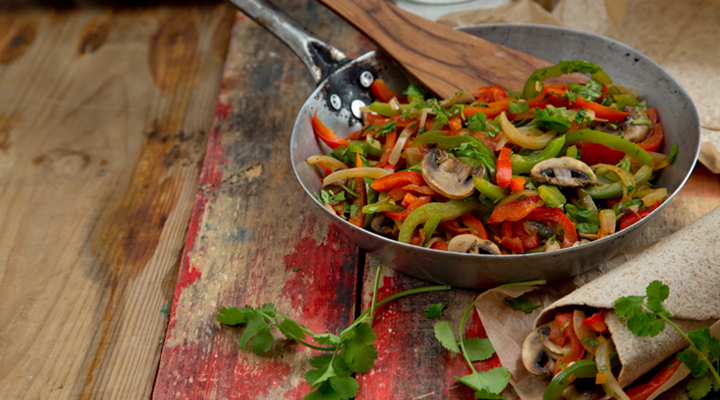 The kids will love these quick and easy vegetable fajitas! You could also add diced chicken, beef or pork to this recipe. Warm the oil in a large frying pan set over a low heat. Add the onions and garlic and cook for 5 minutes, until soft. Stir in the green and red peppers, chillies and coriander and cook for 10 minutes. Meanwhile, heat the tortillas according to the packet instructions. Add the mushrooms to the pan and cook for 1 minute. Season to taste and divide the vegetables between the tortillas, then roll up and serve.